Four years have gone by since the color orange lost its association with fruit. 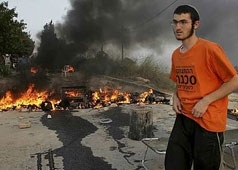 Orange was the color that signified opposition to the disengagement from Gaza. It appeared as ribbons, as T-shirts, and even as Stars of David. The disengagement was called expulsion, deportation, evacuation, and to this day the name one uses is a political locator. At the time there was talk of an improved security situation, new energy to the peace process, increased international regard. One left-wing politician at the time thanked the Prime Minister for ensuring that his son would never need to serve in the Gaza strip. His words were re-broadcast on the radio this week, ringing painfully to the memories of Operation Cast Lead. The traumas of the Gaza disengagement continue to resonate. The army soldiers pulling out the settlers, the burning synagogue images the following night, and to this day the treatment of former Gaza residents remains an open sore. “A Jew does not expell a Jew!” cried orange-clad protesters throughout the land. Is this the only conclusion to be drawn? Or are there greater issues at stake?